For me, the real highlight of the college football national championship game earlier this month was Clemson head coach Dabo Swinney. He sprinted down the sidelines, arms pumping and grinning widely, on a long pass play for a touchdown, enjoying the game and the thrill of it like a little kid. The way he hugged those big senior lineman near the end of the game as they were bawling their eyes out was priceless. Then his interview on the field afterward with Tom Rinaldi let the whole world know who the source of his joy and success is: Jesus! That’s one great football coach! And what a bold and joyful testimony about Jesus he gave right there on the field in front of the whole world. When you follow Jesus with a surrendered heart and with the reckless abandon of simple, childlike faith, great joy will be your reward, just like it is for Dabo. 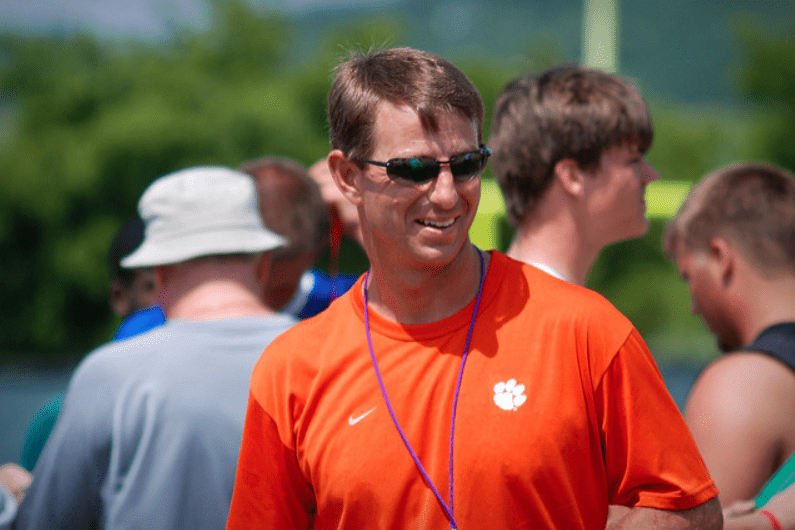 People will want to be around you and follow you, just like Dabo’s players and coaches do. And as Nehemiah 8:10 declares, the joy of the Lord will be your strength. So if you’re looking for real joy, and real purpose, and a life that impacts others, surrender yourself over to Jesus fully and completely. And fasten your seat belt — a great adventure of faith awaits!